Here’s the problem. Real estate agents sometimes act weird and that weird stuff often confuses or makes home sellers angry. Let’s say you plan to sell your house so you interview three real estate agents. Each agent goes into excruciating detail into how they would market your amazing home to get you top dollar, but you’re most interested in how much they think your house is worth. The three agents estimate three different selling prices, two of the estimates are close to each other. You think the two agents are lowballing you because your estimate of the house’s value is much higher. You’ve heard how real estate agents want you to underprice your house so they can sell it quickly with little work. You’ve read “Freakonomics” and think the longer a home is on the market, the more money the seller gets. You’ve heard a guy at work brag that every real estate agent told him his house wouldn’t sell for $X but all the agents were wrong and the house sold. So when the third agent comes in with a estimated selling price for your home which is a lot higher than the other two estimates, you immediately like that third agent. That agent, you think, is obviously more knowledgeable about the market and isn’t trying to lowball you. You hire the third real estate agent. You may think it’s weird that agents would try to lowball you when they can make so much money by selling your home. But you can’t understand real estate agents until you understand one basic fact. It’s something that real estate agents are very painfully aware of but which home sellers are usually oblivious to. Around 30% of the homes listed for sale won’t sell. 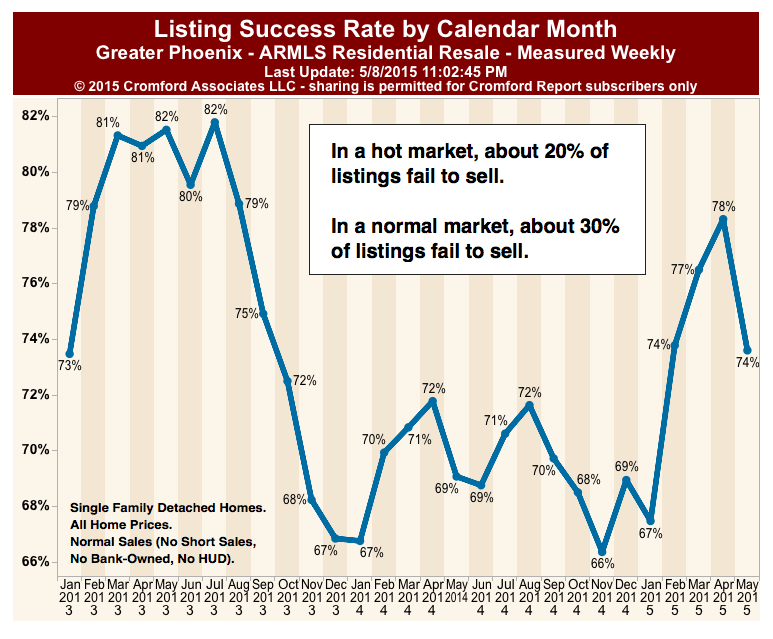 chart is For Phoenix but the listing success/fail rates will likely be similar elsewhere in the united states. That means about 30% of the time, all the time and money those real estate agents put into trying to sell those houses was a 100% loss. They get $0 for all their efforts and lose all their time and out-of-pocket cash expenses invested into selling those houses. Homes that don’t sell are killer to agents emotionally and financially. Real estate agents hate them but they’re common, around 30% of homes listed for sale with the average real estate agent don’t sell before the agent’s listing ends. Homes that don’t sell are why real estate agents go out of business. Home sellers don’t appreciate how this fact shapes the way real estate agents act. When homes fail to sell it’s almost always because they’re overpriced. The main strategy real estate agents use to reduce their risk of investing time and money into homes that won’t sell is to avoid taking overpriced listings. In the example at the top, that’s why the real estate agents were so interested in what you thought the house was worth. You were interviewing the real estate agents but they were also interviewing you. Whether you will lower the price fast enough and far enough to get the house sold before you (the seller) fire them (the real estate agent). If you wanted to price the house a few percentage points north of fair market value, that’s usually not a problem for agents unless they think you won’t budge off of that price. If you want to price the house several percentage points north of fair market value, many agents will walk away for fear of taking on an overpriced listing that won’t sell, or at least won’t sell during the time they’re the listing agent. Most of the weirdness and bad feelings between home sellers and real estate agents is because of their differing estimates of home values. You’re not going to like this next bit but if you think I’m shilling for real estate agents, check out this post of mine, “Do real estate agents really sell homes for 13% higher prices?”. It’s normal to think your house is worth more than it’s worth. Psychologists and behavioral economists call this the “Endowment Effect,” the fact that people tend to overvalue things they own themselves. Here’s a storified version of an experiment showing the endowment effect. A group of students was given Cornell coffee mugs as gifts to keep. They immediately thought the mugs were worth twice as much as they did before they owned the mugs. Home sellers have a strong tendency to overprice their homes because of the endowment effect. Some sellers will learn their homes won’t sell at those high prices so they lower their prices until the homes sell. Other sellers – about 30% in a normal market – will learn too slowly or not at all and their homes will remain too overpriced for too long. They won’t sell their homes. Remember those two agents you interviewed that you thought were lowballing you on list price? They probably weren’t trying to lowball you, they were probably just trying to minimize the overpricing of your home. They weren’t being weird, they were being rational. And remember that third real estate agent that came in with the higher estimated value, the agent you ended up hiring? How high does my estimate of the home’s value have to be to be the highest one the sellers get from any agent? We all know that a home seller has a strong tendency to hire the real estate agent who says their home is worth the most. This causes real estate agents to be pulled in two opposite directions by two facts. Fact #1: An overpriced home is less likely to sell and more likely to be a total loss for the listing agent. Fact #2: Sellers are likely to the hire the agent who says the house is worth the most. The agents want the seller to hire them but they don’t want to take on an overpriced listing… but they want the seller to hire them. They’re torn and sometimes they bounce back and forth between the two strategies. It can look weird to a seller when an agent says the home should be priced at $X at the most (Fact #1) but then later says $X+4% is fine, too (Fact #2). Most agents, however, will tend to focus on one strategy or another. The first two agents in the hypothetical example above were focused on Fact #1 and the third agent was focused on Fact #2. To make the most money possible sellers need to know the fair market value of their homes so they can avoid both underpricing and overpricing. And some real estate agents play games with the home values they tell sellers. How do sellers learn the fair market value of their homes? The answer to this problem is obvious but you’re not going to like it because it’s going to cost you some money. Hire an appraiser and get an unbiased estimate of your home’s value. If you have a real estate agent you trust, that’s great, you don’t need an appraisal. But if you have any doubts at all about the value of your house, consider hiring an appraiser. Doubts lead to overpricing and overpricing is expensive for home sellers. If you hire an appraiser, however, be prepared for one thing – you’re going to think the appraised value is too low. That’s normal. But at least you know the appraiser isn’t playing games with the home’s estimated value to generate business and you can move confidently when you’re pricing your home for sale. Hire an appraiser and avoid all the real estate agent weirdness surrounding pricing your home for sale. Added: Also check out my post on the ideal amount of overpricing. See all “How to Price Your Home” posts here. Here’s an article that just came out on how homeowners overvalue their homes. http://old.seattletimes.com/html/realestate/2026398864_bizharney31xml.htmlThe study which isn’t published online says owners over estimate the value of their homes by 8%. But they also reference a study that said the overvaluing is less than 1% so that’s confusing.